*This article was originally published at The Film Experience. Jean-Luc Godard and François Truffaut were the poster boys of the French New Wave, its most recognizable faces. Their friendship that had begun in the 1940s had carried them through all their years at Cahiers and into their directing careers, was evidenced by Godard’s adoration of Truffaut’s The 400 Blows and the latter’s providing the story for his friend’s first film, Breathless. Their early writings manifest the division they had from the beginning about their outlook on the mechanics and politics of cinema. Nonetheless, their friendship continued even through the fraught days of political disagreement in 1968; but no further than 1973. Truffaut’s Day for Night (La Nuit Americaine) was an unforgivable crime in Godard’s eyes, and the latter’s disapproval of the film was a massive act of hypocrisy in Truffaut’s. They were to never see each other again, and only after Truffaut’s death did Godard find nice words to say about his old friend. 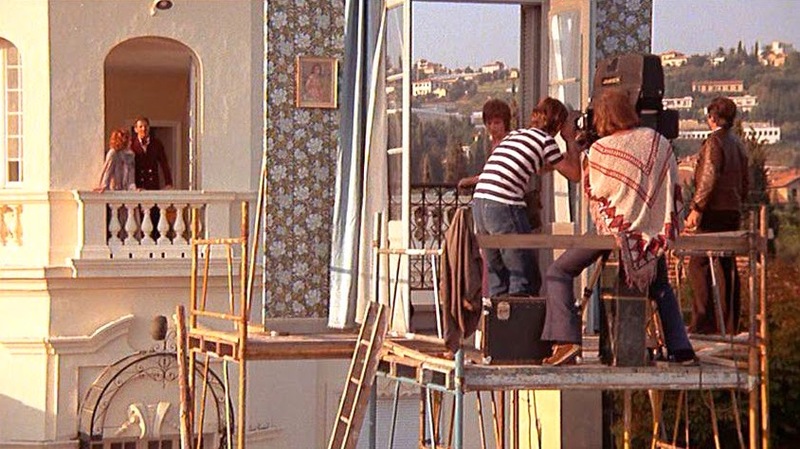 It’s easy to see why Day for Night made Godard’s blood boil. It’s as conventionally constructed a film as one can expect from a nouevelle vague filmmaker, an unashamed love letter to Hollywood and cinema itself – and with an Oscar in its cap, no less. By this time in his career, Truffaut had already been branded a sellout by some and would continue to be called as such. He had, in the opinion of some of the New Wave’s proponent’s, become the very cinema he criticized in his youth. There was no political edge to Day for Night; no radical revision of how the medium operates. It was “a lie,” thought Godard. Some of those accusations might be true, but there is another truth that isn’t mentioned as often: this is an incredible film. When I first watched Day for Night, I was 19. It was in the days when Toronto’s Bloor Cinema wasn’t yet devoted to screening documentaries. It was a cheap, dingy but friendly gathering place for the neighborhood’s elderly and University of Toronto’s students. The repertory screenings weren’t of rare, obscure directors but mostly of the films a young cinephile knows are must-watches. It was an ideal way to see the likes of 2001: A Space Odyssey and Vertigo on the big screen for the first time. It was a perfect way to be introduced to François Truffaut as well, the man who would go on to become my favorite filmmaker, give or take Abbas Kiarostami. A double bill of The 400 Blows and Day for Night is an overwhelming experience for someone who’s never seen either of them before, and believe it or not, it was the latter that enthralled me so completely that night. The plot is simple. We follow a director (Truffaut himself) as he takes a flimsy romance from paper to screen. The film within the film is called Meet Pamela, a French film with a British star (Jacqueline Bisset) about romantic entanglements and affairs and jealousy. The story of Meet Pamela is mirrored in that of Day for Night, where behind the scenes romances and arguments take their toll on the film and the director. Truffaut introduces the director, a stand-in for all filmmakers, as a man who spends his entire time answering questions, be it about casting the British actress with a volatile temper or the pattern on a vase in one shot. What the experience adds up to is a film about cinema made with immeasurable love for the medium. Truffaut’s infectious energy pierces through the screen. His penchant for subtle, affecting comedy, so expertly utilized in the Antoine Doinel series, is at its sharpest. The hustle and bustle of the filming process, at once parodied, romanticized and depicted with sincere fidelity, reaffirm the audience’s enchantment with the magic of the movies. Nowhere is this more evident that a sequence in which we see the admission of an illicit love affair in Meet Pamela. Accompanied by fake rain and an operatic score, and shown through a viewfinder with the crew huddling around it, the two leads give such an authentic, and comical, expression of their feelings for each other, we are swept up in the moment, temporarily unaware of the filming of it. It’s as if Truffaut is reminding us of cinema’s illusion, but simultaneously moving us to embrace its emotional impact. Roger Ebert called Day for Night “the best movie ever made about the movies.” I tend to agree with him, and considering the competition it enjoys for that title – Singin’ in the Rain, 8 ½, Through the Olive Trees, and coincidentally, Godard’s Contempt, to name a few – that is no small praise.